Most Australians feel secure in our food supply; few of us are on the knife’s edge of survival or driven to extreme behaviour. The greatest apparent risk to most Australians’ food security is the inability to use self-service checkouts at the supermarket. But the same can’t be said of our region. Food security is a complex and interrelated set of environmental, social and political issues. It’s bound up diverse policy challenges such as climate change, population demographics and economics—prosperity has changed the diets of hundreds of millions of people, and not always in ways that help the management of food security. The Strategist’s ‘Food Fight: A Food Security Blog’ series will explore how Australia’s food security can be best managed. As well, because of the interplay of regional national stability and food security, there are broader security issues to be addressed. Food security has squeezed its way onto the federal policy agenda; since the global price spikes of 2007–08  there has been a flurry of departmental and media activity around agricultural policy and exports. Some big hitters include the Senate inquiry into milk prices  and this year’s National Food Plan  white paper. But the elevation of food security to the policy agenda of various departments and the private sector is yet to yield a focused, cross-discipline approach, and there’s a dearth of meaningful policy as a result. Perhaps there’s a lack of a sense of urgency. In Australia, domestic demand for food in 2050 will be 90% greater than in 2000. At first glance, there doesn’t seem to be a problem in providing for ourselves—we have just 0.3% of the world’s population and 3.0% of its arable land. However, factors such as urban encroachment on farmland, water integrity, soil health and increasing salinity  mean that the situation is more complex than those simple numbers would suggest. 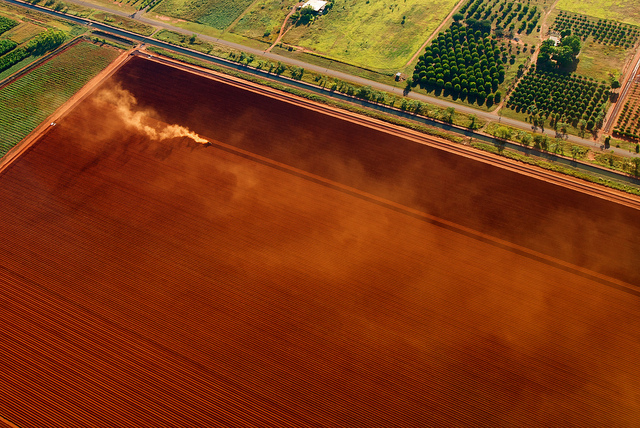 Australian agricultural productivity is already on the decline , and the dual use of land will further tax our ability to meet increasing demand. If Australia wants to be truly food secure, access and affordability is also an issue. Australian supermarket grocery prices are a function of the global commodity market. We must be prepared for the consequences of supply chain vulnerabilities and market fluctuations, particularly as Australia’s imports of food  increase. Australian food policy is also currently directed toward exports  to capitalise on Asia’s changing demands . All this may look good for Australia’s economic future, but arguments between food producers and government  over pricing , tariffs and subsidies  continue. This is a potential turn-off for foreign trading partners and investors, with impacts on grocery prices. Additionally, fewer Australians are able to afford quality food: 2.2 million people in Australia are currently living in poverty , and the government spends 3.2% of its GDP on income support  (the OECD average is 6.5%). As well, Australia has economic and security interests in ensuring that other countries in our region and beyond also have robust food security. The UN Food and Agriculture Organization says that, globally, 70% more food will be required by 2050 to feed an extra 2 billion people. More research and development partnerships between developed and developing nations across the economic, political, social and agricultural sectors may go some way to addressing this quandary. Food security has remained high on the agenda of G-8 and G-20 meetings, in light of the price hikes that have rendered food inaccessible to large numbers of people. Politically-charged violence can follow, as seen in places like Indonesia, India  and Egypt . An average of just 12–14% of ordinary Australian household income  is spent on food, compared to Indonesia’s 37% . While food riots don’t seem to be a looming prospect for Australia’s decision-makers, neighbourhood political security problems are of concern to us. Food provision is now part of a global system, and current Australian food policy might not be adequate to ensure our national security in the longer term. The ‘Food Fight’ blog series intends to explore the nexus between Australia and the interdependent global system in the context of food security. It will host contributions on this topic from a range of experts across Australia’s food security community. It will assess the prospects of Australia becoming Asia’s ‘food bowl ’, and will examine the vulnerabilities of Australia’s food provision. It will look at whether food insecurity in Asia is a result of problematic distribution or systemic market failures, and at the impact of changing regional demography and demand. Sarah Norgrove is a research assistant as ASPI. Image courtesy of Flickr user Pete Hill .